ORIGINAL PROP WINDOW CARD MOVIE POSTER. If it has any minor defects like pin holes, creases, etc. And they are not mentioned above, they should be visible in the high resolution photo. WE DO NOT SELL REPRODUCTIONS OF ANY KIND. 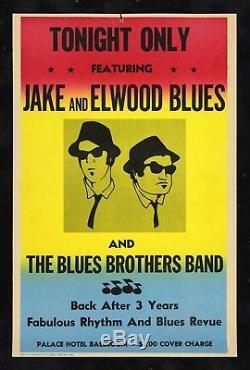 ORIGINAL PROP WINDOW CARD MOVIE POSTER printed in 1980 for use in the motion picture "The Blues Brothers". This poster is NOT framed. This is not a reproduction. We have handled a few of these over the years. We have spoken directly with Tribune Showprint (the original printer of these back in 1980). We know what the reproductions look and feel like. This is not one of them. This is one of the posters that was actually used on set. We acquired it directly from the owner who was a film crew laborer who had permission to keep it after filming was completed. He tore it off the wall of the set and left the tear hole at the top. Comes with a letter of provenance from the original owner. The cardstock has aged a little bit but still presents nicely. Measures 1/2" shorter than others we have handled at 14" x 21.5 but it does not appear to be trimmed. The owner says he never trimmed it and that is how he acquired it. One of the holy grails of poster collecting is this prop poster from the movie "The Blues Brothers" printed by TRIBUNE SHOWPRINT INC. Only 100 were ordered for the film. It is believed that they were printed on a Babcock Press with wooden type. These are extremely rare as not many survived filming. As can be seen in screen shots from the movie, each one is slightly different. The red, yellow, and blue inks melt together in a Rainbow background, but never in exactly the same place. For example, in the poster John Candy is holding, if you look closely at the text "THE BLUES BROTHERS BAND" you can see that the background is entirely blue behind the text. If you look at the one Ray Charles hung upside down! , you can see that the background behind the text is a mix of yellow and blue. Why would they be different like this? These were made one at a time similar to a silk screen method. The three inks red, yellow, and blue were possibly on the screen at the same time as they were pushed back and forth with the squeegee through the screen on to the posters. Printed on cardboard card stock. In the Aretha Franklin shots you can see the back is a typical cardboard color light grayish brown. Tribune Showprint is still in business and has reproduced this poster several times over the last 30+ years. These reprints have slightly different colors and are on a slightly different kind of card stock paper than the original. In 2011 a representative from the company informed us that they estimate they have made more than 500 of these reprints over the years. There have also been countless other repros made by other companies, but they are usually on paper and not on cardboard stock like the ones made by Tribune Showprint. You will have trouble finding a nicer one. Not in perfect shape but still very presentable. Paper has aged a little bit. This is NOT a reprint or reproduction poster! We are absolutely certain it is authentic. You may be willing to take the risk to save a few dollars, but we are not. We use super strong hi-quality packaging materials including thick cardboard, masonite, and costly pvc plastic tubes. And guaranteed to arrive safely. Please be advised that over 95% of all Original Movie Posters. Printed before the mid 1980's were issued FOLDED. This is NOT considered a defect. They usually appear in insert size 14" x 36" and one sheet size 27" x 41". Again, all we can say is BEWARE! We grade our posters according to the Iguide Universal 10-Point Movie Poster Grading Scale. C10 Mint - Investment quality. No perceptible flaws of any kind. C9 Near Mint - Investment quality. Minor flaw on an otherwise unused poster. C8 Excellent - Investment quality. C7 Very Good to Excellent - Fine condition. Sometimes it isn't possible to do this. Sometimes we can't roll a folded poster. Please note that if we hold your items for longer than 30 days they will NOT BE RETURNABLE. WE TAKE EXTRA SPECIAL CARE WHEN WE PACKAGE YOUR ITEMS. We can yield for you MUCH MORE than you would get if you auctioned them yourself up to TEN TIMES or more! Let us sell your posters for you! For more information about CineMasterpieces please see. We guarantee that all posters we sell are graded and described accurately. Unless otherwise specified in the description, ALL POSTERS ARE ORIGINAL MOVIE POSTERS original theatrical movie posters that were displayed or meant for display (unused) in theaters at the time the movies were released. We will put in writing that we guarantee it to be an Original Movie Poster. The item "BLUES BROTHERS CineMasterpieces 1980 ORIGINAL PROP MOVIE POSTER JOHN BELUSHI" is in sale since Thursday, May 24, 2018. This item is in the category "Entertainment Memorabilia\Movie Memorabilia\Posters\Originals-United States\1980-89". The seller is "cinemasterpieces" and is located in Scottsdale, Arizona. This item can be shipped worldwide.